SUMMARY: In Victorian London, Audrey lives a double life. Half the time, she's a proper, upper-class lady. The other half, she works in her uncle's morgue, dissecting dead bodies. 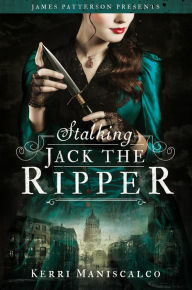 When a string of corpses begin turning up in the morgue, Audrey finds herself getting caught up in a murder investigation, and trying to hunt down someone known only as "Saucy Jack"
WHY I DIDN'T FINISH: My main issue with this book was that it was boring. I've had this issue with historical fiction before; it takes so long to set the scene that by the time the plot really picks up, I've stopped caring. And even though the murders began early, since Audrey wasn't really emotionally connected to them, it was hard to care. My other main issues were that Audrey was a bit too "I'm not like other girls" for my taste, and I haaaaaaaated her love interest. Like, oh my God, Audrey, honey, you're too good for him. Once I realized I'd have to suffer 300 pages of this douchebag, I gave up pretty quick. Thank you for reading! Hopefully, I'll get through my new book -- "The Merciless" by Danielle Vega. If you'd like to vote on the book I'll read after that, you can check out the poll on my Patreon page! Remember, though; only patrons get to vote!